Has anyone ever tried sprouting their own beans, grains, seeds or nuts? It is so easy, trust me, and rewarding. Some grains or beans require more time and others just around 1-2 days! average time is between 2 to 4 days. 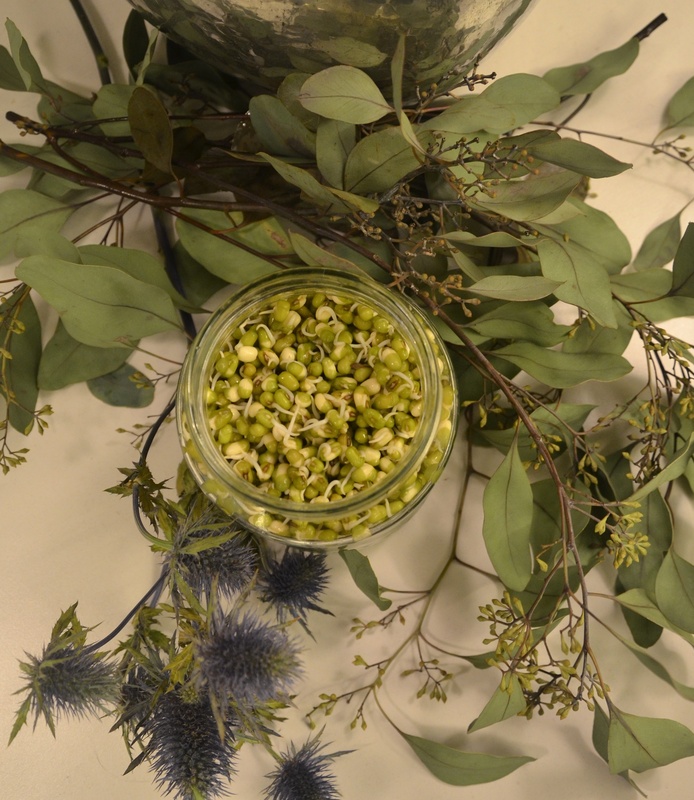 I’ve tried sprouting chickpeas, quinoa, mung beans, buckwheat. Why do it? because eating a sprout means it’s raw. Eating raw wholefoods means you get all the beneficial nutrients in them, including vitamines and minerals that you loose while cooking them in boiling water. But also I love sprouts because you can add them to salads, soups or smoothies and gives a really nice crunch and good texture. on the market you can find sprouting trays or sprouting jars. 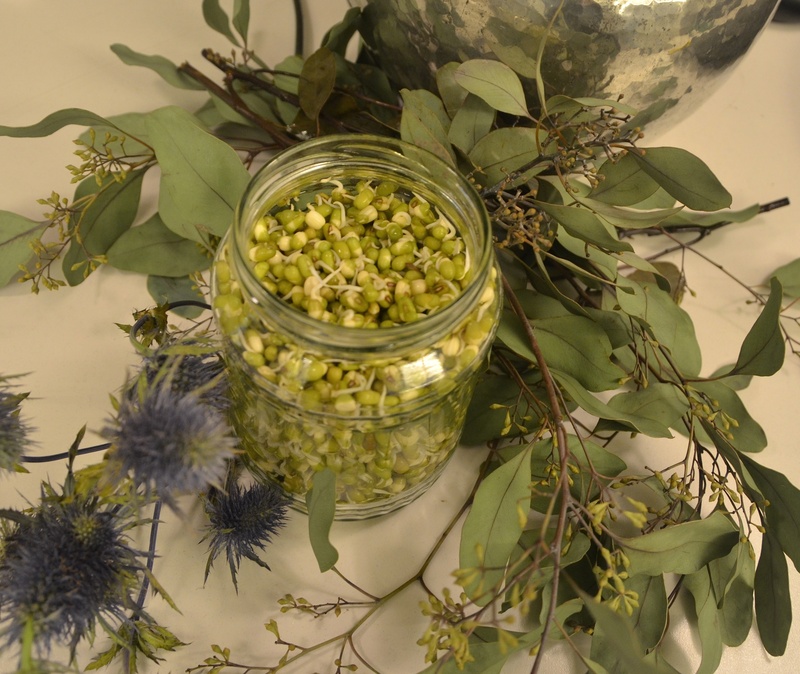 When I first tried sprouting I simply used a jar and covered it with a cheese cloth. But eventually bought a sprouting jar that has a straining lid for it, it’s inexpensive and more practical (mine was 10 euro on amazon). 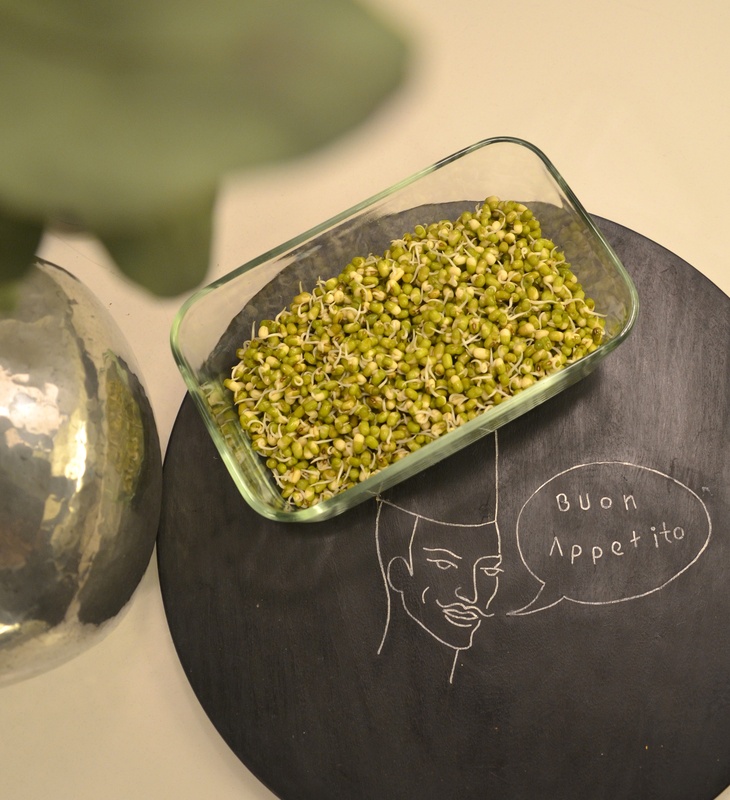 How to sprout beans or grains? 3. cover your jar with the cheese cloth or with a strainer lid like this one. 4. rinse your grains/beans twice a day and then strain, keeping them moist. NOTES: remember to keep your jar in a warm and sunny place (they need light to grow!). The grains/beans have to be always humid that’s why you rinse them often and have a free flow of air. Once you have sprouts refrigerate them and use up to 4 days. 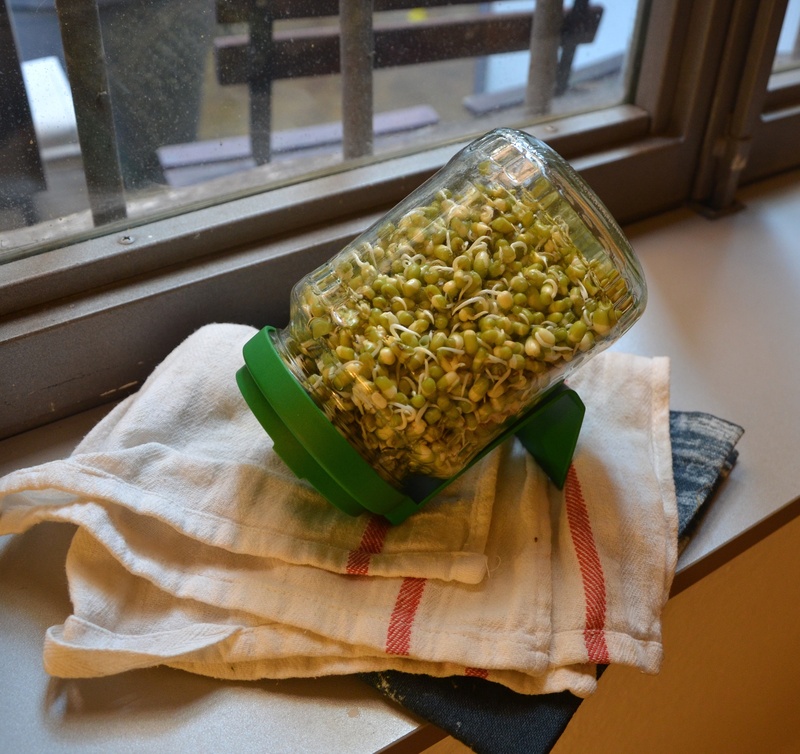 NOTES2: the final sprouts are triple the volume of your initial grain/beans! 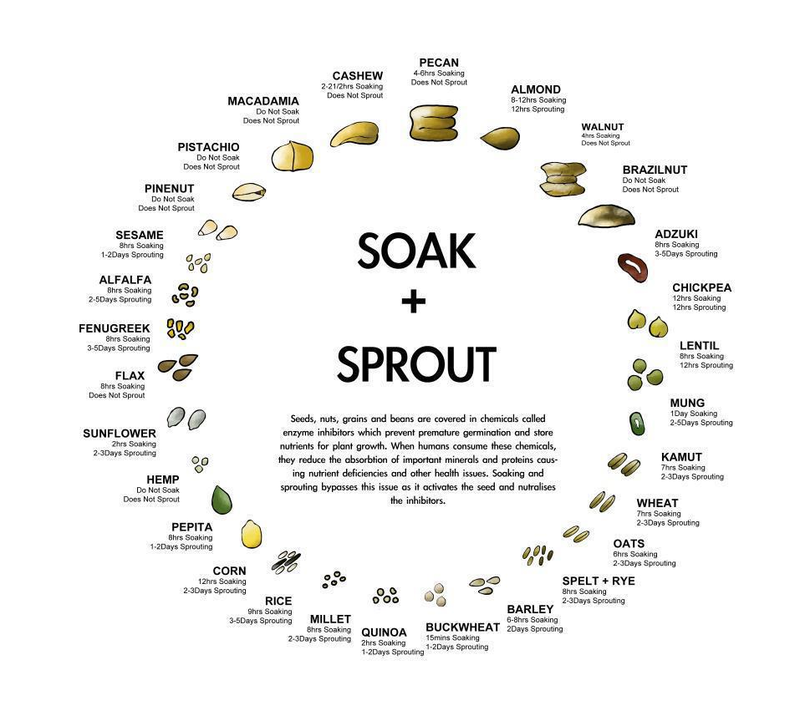 Check on this picture for soaking and sprouting times for grains, seeds and beans: I like to sprout Mung Beans, they are so easy and takes no more than 2 days to have fresh sprouts! 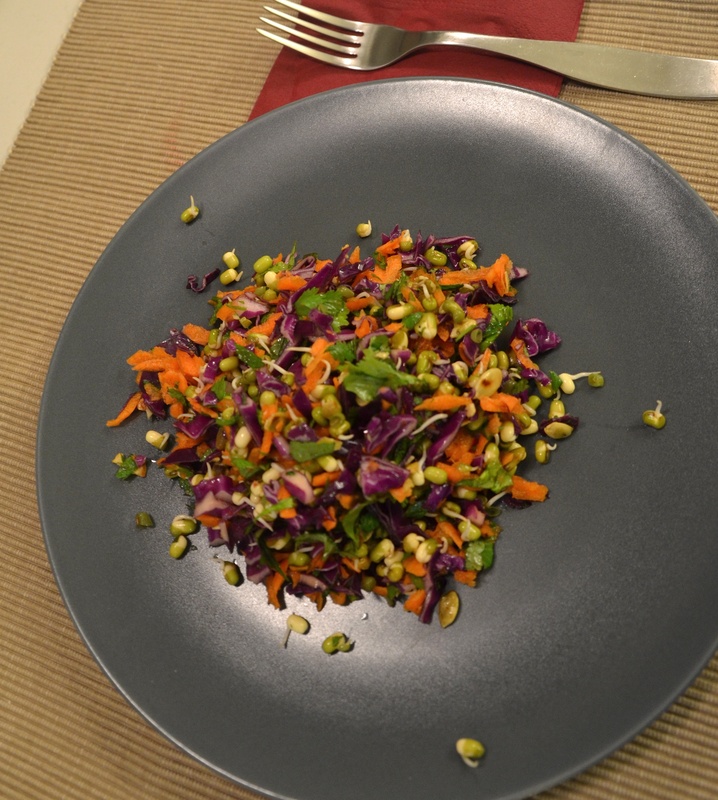 This time I made a salad, entirely raw, and very colorful, crunchy and nutritious. 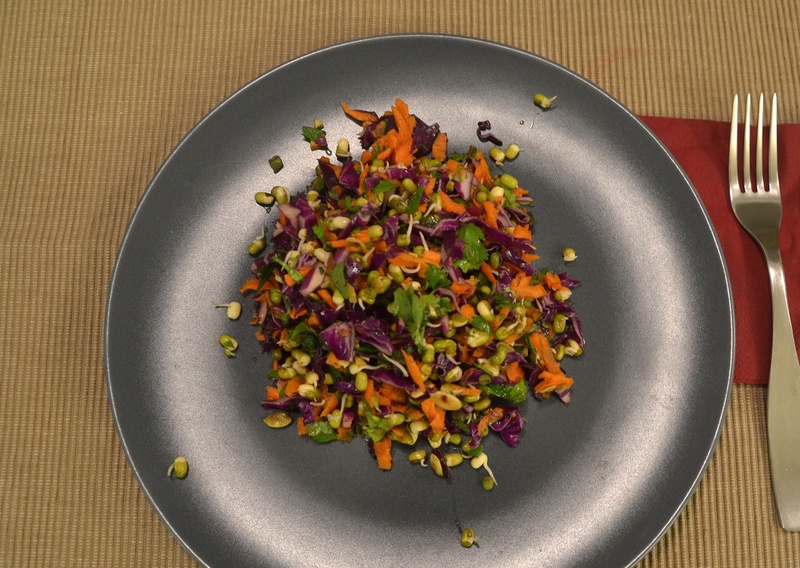 In a big bowl mix in the sprouts, peeled and grated carrots, roughly chopped herbs, sliced and chopped cabbage. toast the seeds, chop and add to salad. dress with olive oil, soy sauce, rice vinegar, salt and cayenne pepper.